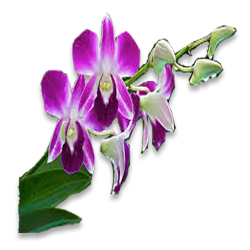 Orchids are noted for their beautiful, long-lasting flowers, widely differing in shape, size and colour. They belong to the family Orchidaceae, which comprises over 600 genera, 30000 species and thousands of man-made hybrids. Orchids have varying habitats but epiphytic orchids dominate the trade. They are also classed as monopodials (stems having a vertical growth, non-branching, with aerial roots) and sympodials (stems having a horizontal growth, producing pseudobulbs in clusters, no aerial roots). 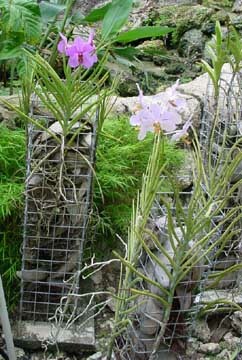 The ideal location for orchid growing is in the open conditions, under appropriate level of shade nets. In Kerala it is also grown under the shade of coconut trees above 10 years old. Most attractive orchids belong to the group of epiphytes, which require free moving air at all times. The orchid plants produce aerial roots, which absorb water and nutrients from the atmosphere. Both terrestrial and epiphytes grow under varying levels of shade. Plants grown under deep shade will have good vegetative growth and poor flowering. Hence shade and light regulations are very important operations for better flowering. This requirement varies with the species and varieties. Some species grow in open sunlight. A humid and warm atmosphere is congenial for the growth of most of the tropical orchids. Better results are obtained when the atmospheric humidity is 50 to 80%. Orchids require proper temperature for good growth and flowering. Accordingly there are tropical, subtropical and temperate orchids. 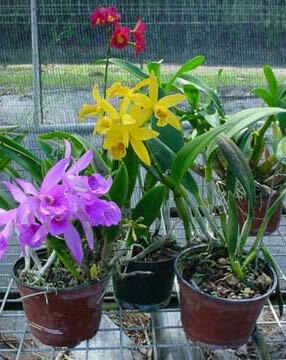 The popular genera of orchids that are suitable for growing in Kerala are Arachnis, Aranthera, Vanda, Phalaenopsis (monopodials); Aranda, Mokara (inter-generic monopodials); Dendrobium, Cattleya, Oncidium (sympodials). 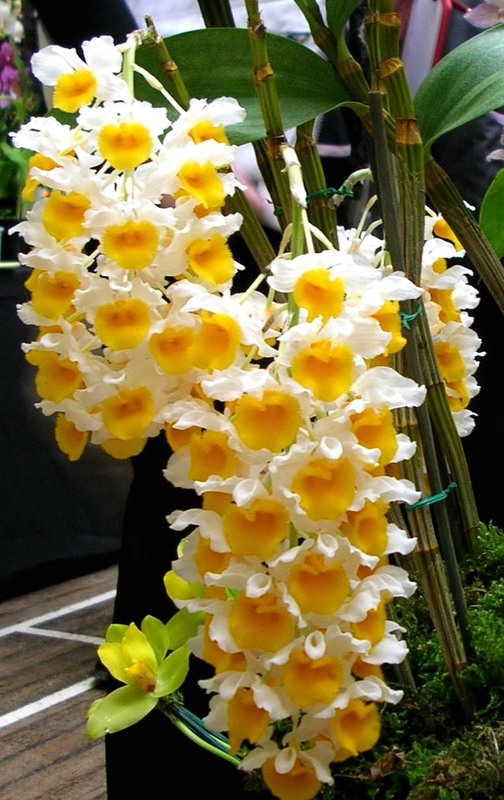 Dendrobium is the most popular genus of Kerala. Some of the important varieties belonging to this genus are given below, grouped according to colour. The conventional method of propagation is by vegetative means. Monopodial orchids are propagated by stem cuttings. Terminal cuttings with one or two healthy aerial roots are ideal as planting material. Basal cuttings of 30 cm length with a few roots and leaves are also good. But they take longer time to sprout and grow. Sympodial orchids are propagated by separation of pseudobulbs. A plant with minimum two or three pseudobulbs with the basal root is ideal for planting. Some of the sympodial varieties produce sprouts at the top of pseudobulb called as keikis. Keikis when fully grown can be separated and planted. Besides, back-bulbs or spent canes (shoots that have ceased to produce flowers) before they shrivelled can be severed from the mother plant and placed horizontally over the medium to stimulate sprouting of new shoots. Seed propagation is possible only under aseptic conditions. Seedlings produced by embryo culture will take 2-5 years for flowering, depending on the genus. Meristem culture is very effective in large-scale propagation of orchids. Terminal cuttings of monopodial orchids are planted loosely on old coconut husks at a spacing of 30 cm between plants and 45 cm between rows in long beds. There can be two or three rows in a bed. Basal cuttings will sprout within a period of two months. Partial shade up to 50% is required for sprouting. Basal cuttings are planted close to each other in nursery beds for sprouting. After sprouting they are planted at the recommended spacing. Monopodial orchids can be grown on ground above soil level. A thick bed of 15-20 cm height is loosely arranged. Well-dried coconut husks are better than fresh husks. Sympodial orchids are grown on benches above ground level or suspended from above. Slotted wooden baskets filled with small pieces of dried coconut husk or partially burnt charcoal is good for plant growth. Planting is done above the medium with a support for proper anchorage. Planting can also be done in pots or other containers. Mud pots of 10-20 cm diameter with several large holes on the side and bottom, filled with tile bits, chopped coconut husk or charcoal are used for planting. Both monopodial and sympodial orchids are to be supported properly since the planting is done above the medium. A clear solution of fresh cowdung can be used for irrigation for a few days. Dipping in fresh cowdung solution before planting also gives good results. Monopodial orchids grown on ground can be given cowdung slurry once in a month. One kg fresh cowdung mixed in 5 litres of water is sufficient for one square metre. Two to three applications can be given in a year. Sympodial orchids are sprayed with the supernatant liquid of cowdung slurry. Nutrition of plants from the natural sources is not sufficient to support the plants for economic production. Hence additional feeding is required. Foliar feeding is very effective in orchids. Fertilizer mixture of N:P2O5:K2O 3:1:1 can be applied during vegetative period and 1:2:2 can be applied during flowering period. The usual dose of such mixture is 2-3 g per litre of water, applied twice a week. These can be controlled by application of mancozeb, carbendazim etc. at the recommended dose. Spraying should be done prior to the commencement of monsoon and at fortnightly intervals during heavy monsoon. Important virus diseases are mosaic and ring spot. Destroying the affected plants can control spread of these diseases. The common pests attacking orchids are thrips, aphids, spider mite, soft scale, mealy bugs, orchid weevil, ants etc. Insecticides at suitable concentration can control all the insects. Other very serious pests of orchids are snails and slugs. They feed on the tender young shoots, roots and buds. Hand-picking is effective, if the number of plants is less. They move out during late night and hide before early morning. Damage is caused during this period. All the pests can be controlled by application of contact and systemic insecticides at appropriate concentration. The spikes are harvested when all the buds of the spike except two or three are open depending on the genus.